Photo by Carlo Verso on Unsplash. NICOLE: HAPPY DONUT DAY!!!!! Did you get a donut? JENN: My co-worker and I actually went to get some yesterday to beat the rush. NICOLE: Hahahaha! I should have done that! There’s no donut place near my apartment (the nearest one is a 40-min bike ride away) so I went to a coffee shop and got a pecan roll. Because donut stores also sell pecan rolls, so that counts! JENN: So, we have found the one downside to moving to a medium-sized city — no local donut shops? LOL! 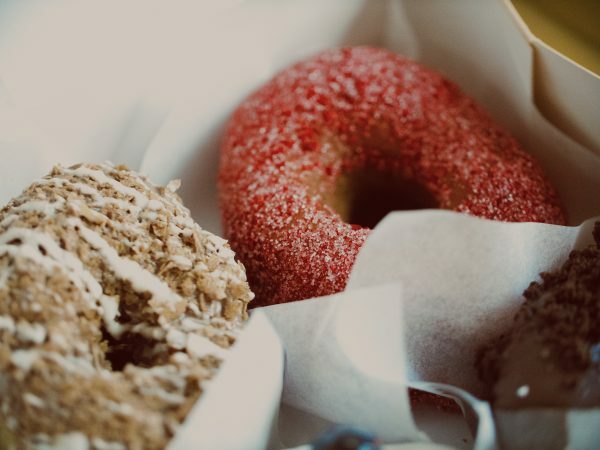 I found a EaterSF list with the 12 best donut places in SF and we picked the one closest to the office. We split a half dozen donuts (some still warm from the oven) and I regret nothing! NICOLE: On the subject of “things you don’t regret,” I heard you had BIG NEWS for The Billfold! JENN: YESTERDAY I PAID OFF MY CHASE VISA! I AM DEBT FREE FOR THE FIRST TIME IN 7 YEARS!!! JENN: Thanks to the monthly check-in posts, my jealousy of your savings plan, and a couple of other tricks I picked up along the way, I curbed my grief/YOLO spending for the past three years and knocked it out in about 10 months — which is still crazy to me! NICOLE: How much were you paying each month? JENN: I always started with a flat $200, but that really wasn’t knocking anything out, so last August, I decided to use my credit card for all my spending (instead of using it when I ran out of money and then… not really paying it off…), so I was paying off my current purchases every day. Plus, I started using my 52 week saving plan money as extra weekly payments, so probably an extra $150-$200 a month there. And instead of putting my “10 percent of your paycheck goes in the bank” into my savings account for my second check of the month, I threw it at my credit card (so another $170ish). Plus any leftover money at the end of the month (LOL), I’d throw on there as well. NICOLE: And how much debt did you pay off, in total? JENN: At the highest (July 2016), it was $7,000.02. Soon after I paid off my cross-country move in 2011, I started racking up the debt, so I had about $1,500-$2,000 on that card, but after my grandma died in January 2015, it kinda went off the rails. NICOLE: Because of the aforementioned grief/YOLO spending. JENN: Yeah, after my grandma died, we had two different memorial services across the country from where I live, so I was spending a lot of money to travel for things I didn’t “want” to do. So, I decided to buy tickets to a Broadway show with my favorite actor (Matthew Morrison) during spring break (I also got see The Daily Show with Jon Stewart). Definitely did not have the money for that, but I rationalized it as self-care. Then in January the next year, I took my mom back to NYC to see one of Matthew’s last performance’s of that show for a girl’s trip around the anniversary of her mom’s death. And then I decided to go to London for a play that my other favorite actor (Matthew Perry) was doing. London is one of my favorite places, but I booked the trip like five days after getting home from NYC. I basically kept traveling (or planning travel) as “self-care” and a rationalized tribute to my grandma (who traveled to all continents except Antarctica during her life). NICOLE: It makes sense. There are times in our lives when travel feels necessary. Now that you’re debt free, what happens next? JENN: Well, as I said, I’ve been quite jealous of your net worth increase and savings plans. We started out with similar incomes when you took over The Billfold, and I’ve watched you increase your income, pay off your debt and start saving more. So my first plan is to work on increasing my emergency fund and travel fund, so I can keep traveling, but not take on more debt. Plus, I’m working on the increasing income part, but that’s a little harder for me as an employee of a company, not freelance. NICOLE: Fair enough! I hope you’re successful at all of those goals — and with the way you’ve paid off your debt, I’m betting you will be.